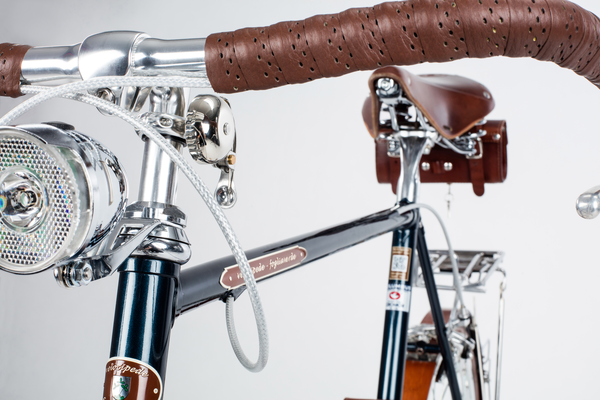 Design and ready for everyday use - that's our credo. 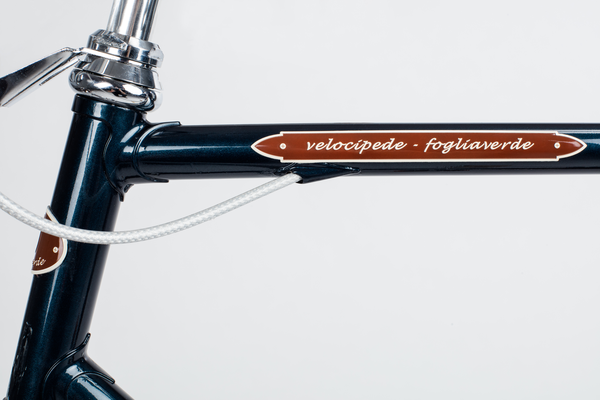 Therefore your velocipede-fogliaverde bike comes fully equipped with carefully chosen valuable accessories and features. 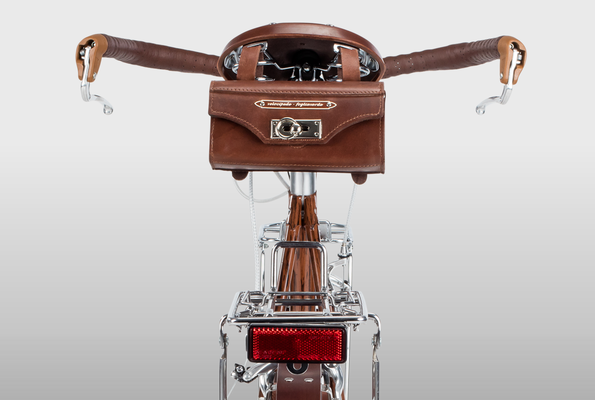 Classic, dynamo powered lights, foldable steel lock in a leather case, leather saddle bag with tools, two steel porters, kickstand and so on. All included. 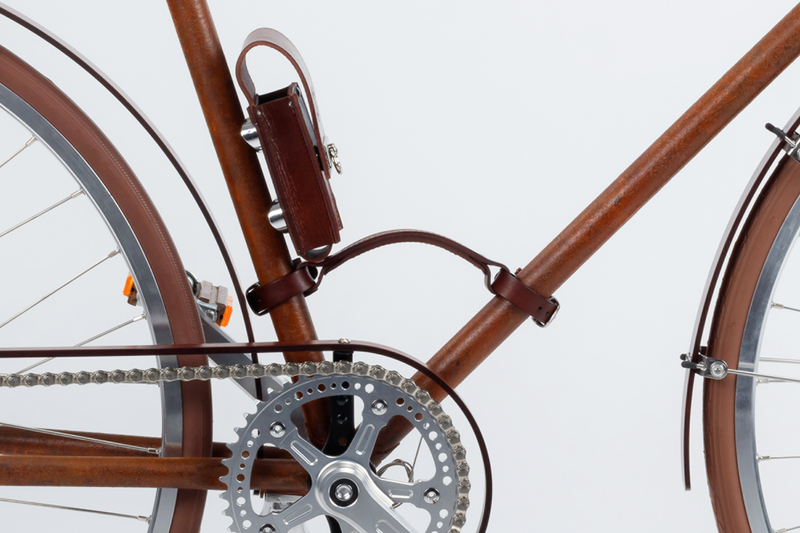 These accessories and features add up to a complete overall picture and make each velocipede-fogliaverde bike a prized luxury vehicle. 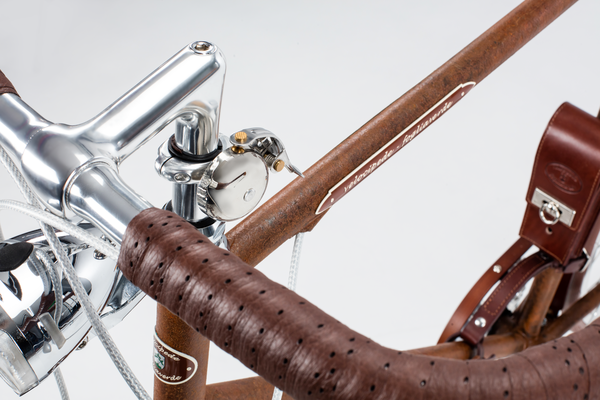 Saddle and handle bar tape in high grade cow leather, saddle with springs and imprinted logo. 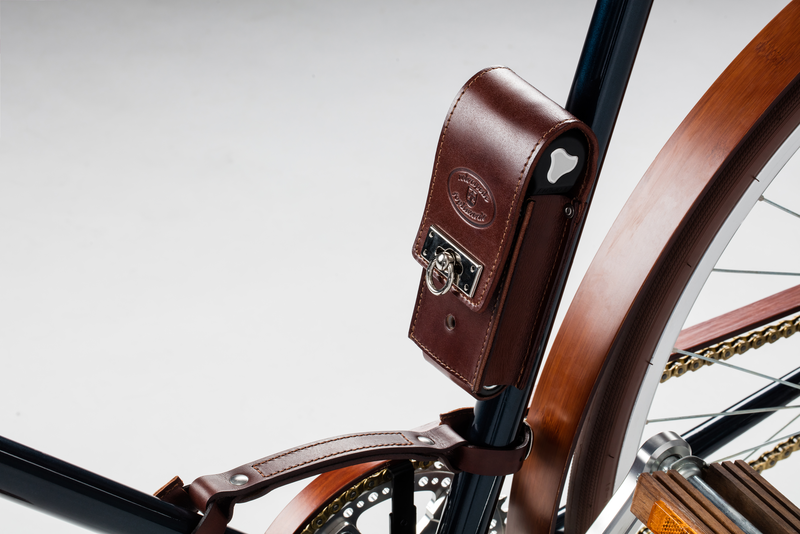 Saddle bag in high grade leather with logo, containing a tool set, cleaning cloth with logo and a nylon cover for saddle and tool bag to protect against rain. Chrome plated steel porters back and front with laser-cut logo, front porter with a practical brown fixing strap. Fenders made of wonderful bamboo, chain guard in cherry wood. Stylish pedals made of extremely dense sucupira wood. 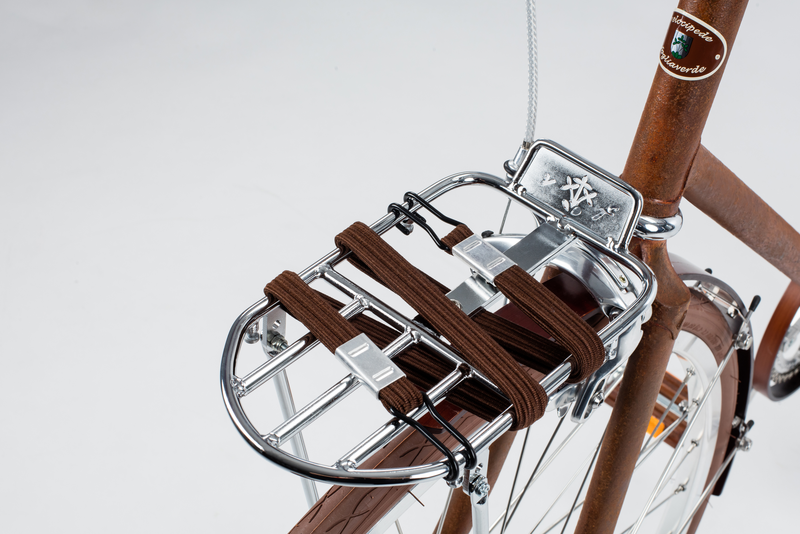 Carrying strap in leather for easy carriage of your bike up and down staircases. 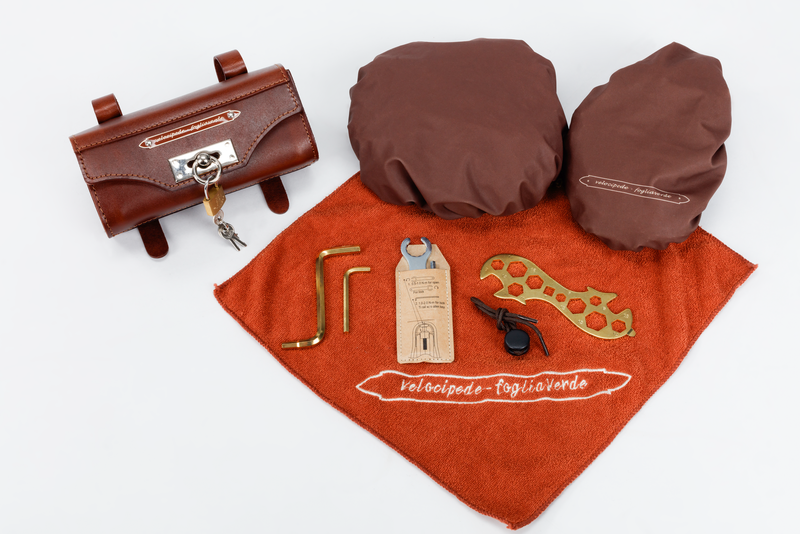 A box of leather soap to protect the valuable leather goods. All cables routed internally for a clean and elegant appearance. iOS and Android supported App to control the E-smart hub. Dynamo hub powered front and back lights 6V/ 3W with on/ off switch. 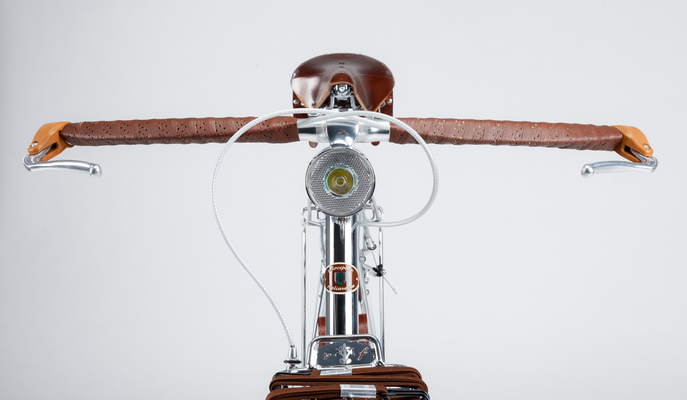 You are visible whenever you ride. 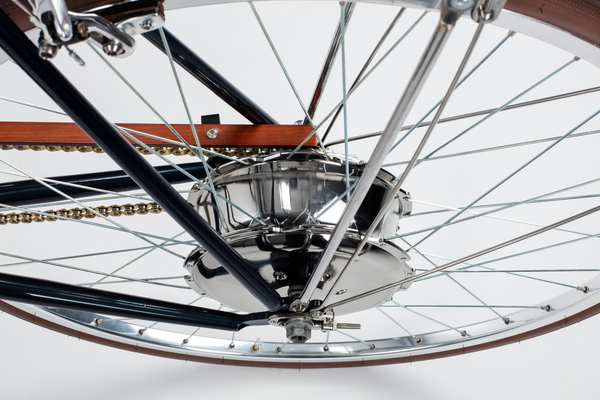 High quality rim brakes Tektro 559. 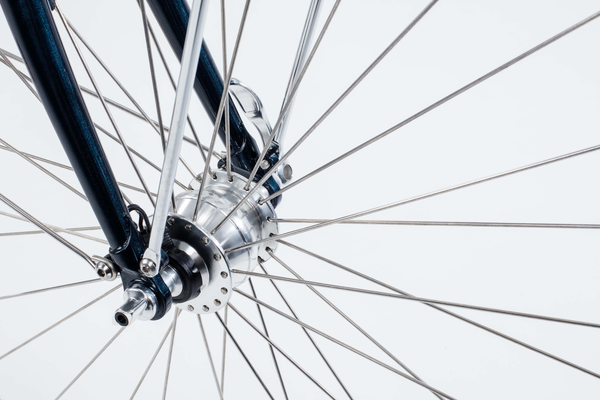 Anti-puncture tires with high density fabric layer for superior protection. 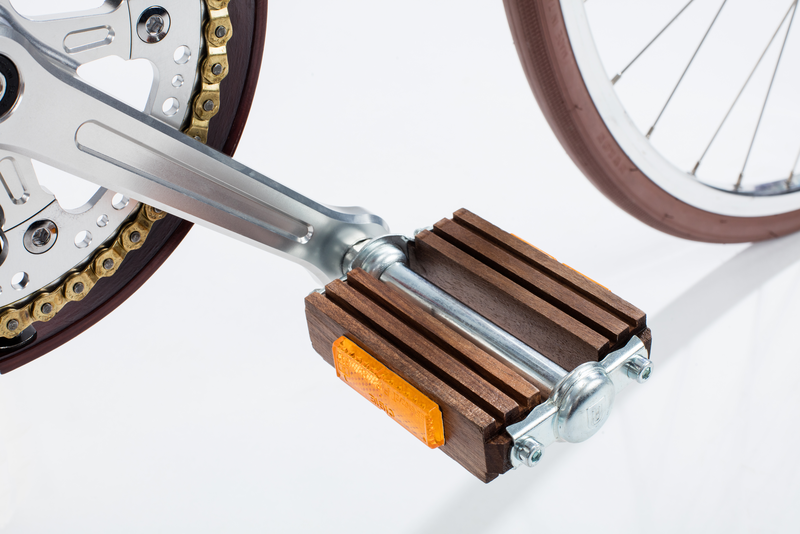 No more flat tires. 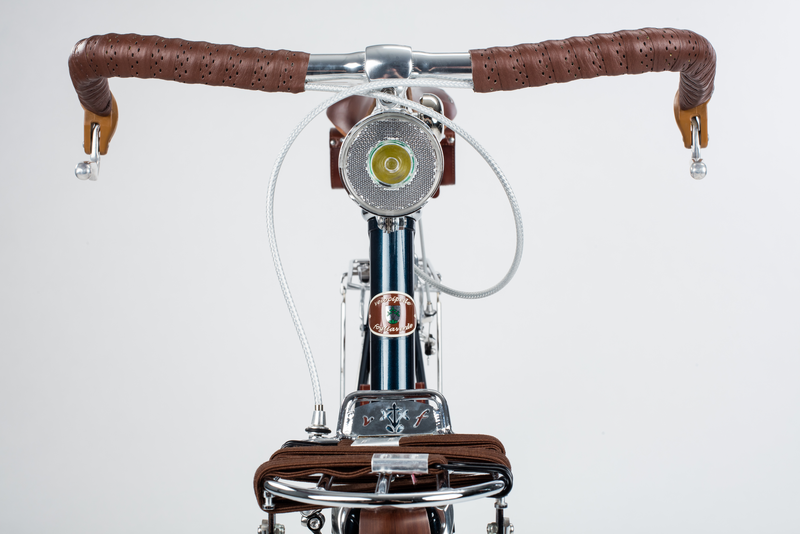 Front and rear reflectors on pedals. 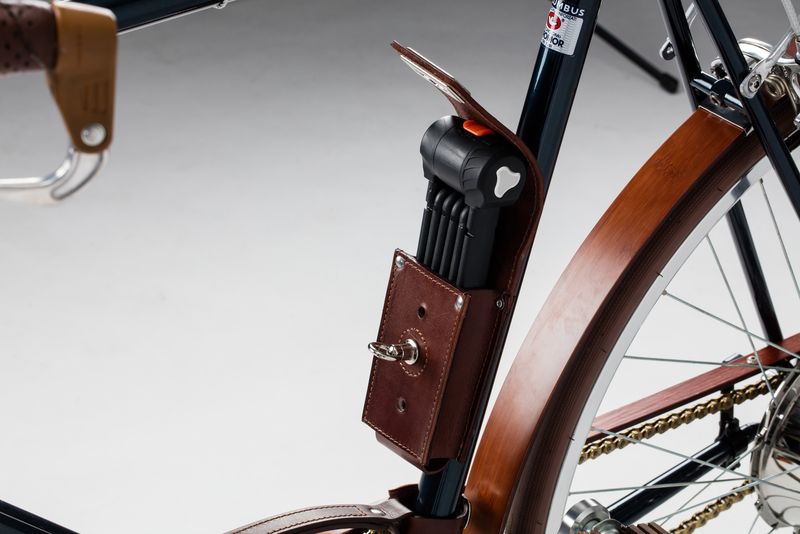 Strong folding lock with key in a high grade leather case with imprinted logo and fixed to the seat tube. 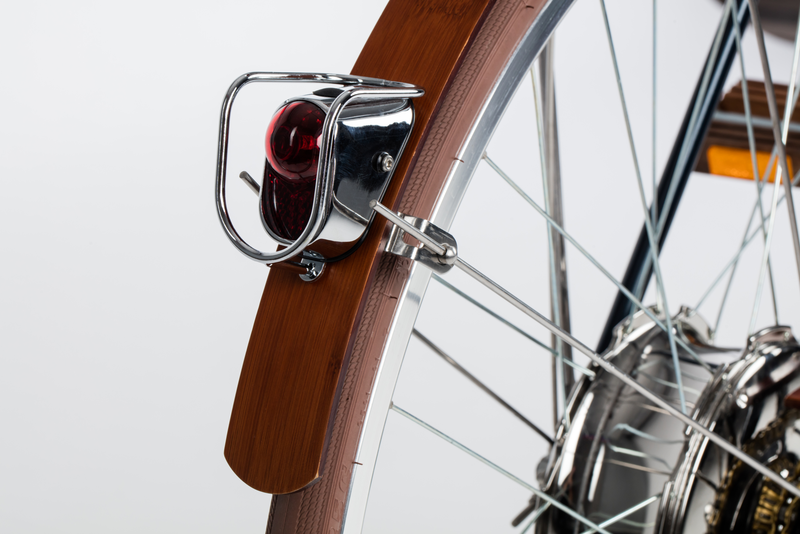 The E-smart rear hub can be locked via smartphone and personal pin code. 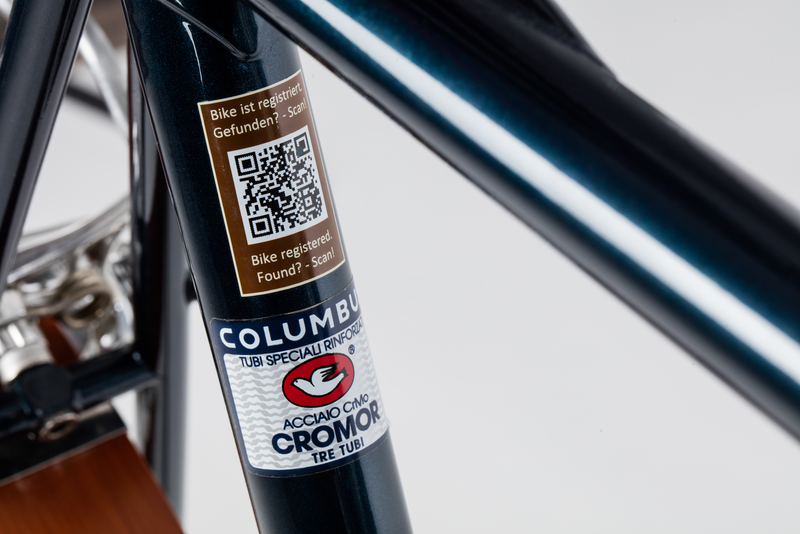 Serial number and QR Code. Register your bike on our website with the bike's unique serial number engraved on the bottom of the frame. In case your stolen bike gets found, the QR code on the frame allows the finder of your bike or police to get in touch with you via our Website. 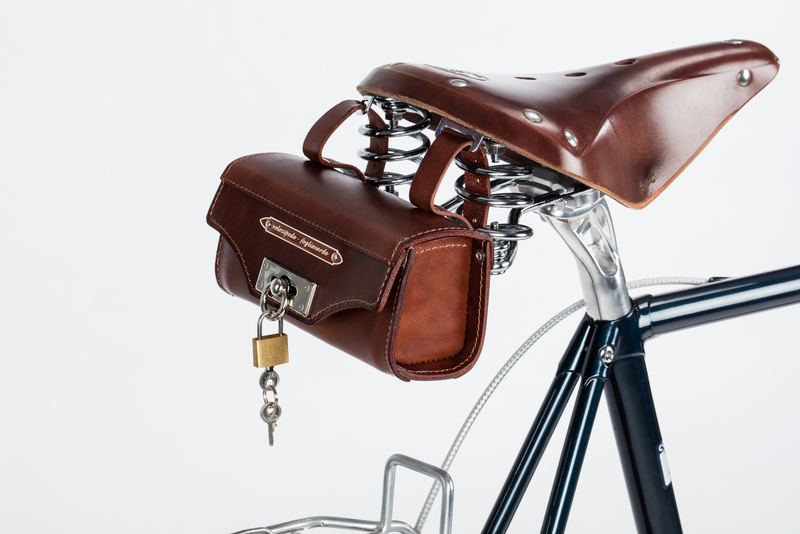 All removable parts like saddle bag, porter strap and carrying strap are secured with either rivets or screws against easy theft.